Giant cheese sculpture rivals 50- foot hot dog! The Indiana 4-H Foundation marked its 50th anniversary with the making and eating of a 50-foot hot dog in the 4-H building on the Indiana State fairgrounds. Not to be outdone, the Indiana Dairy & Nutrition Council celebrated its 80th birthday with fairgoers by commissioning and unveiling a giant cheese sculpture in Our Land Pavilion. The sculpture was made from some 1,420 pounds of cheese produced in Indiana. The sculpture was made from some 1,420 pounds of cheese produced in Indiana. The cheese artist, Sarah Kaufmann, did her work during the opening days of the fair in front of all fairgoers who cared to watch. She has appeared at the fair and made various sculptures from cheese for the past several years. Sources say that despite all the interest in food and food shows these day on cable and satellite networks, Kaufmann, known affectionately as the Cheese Lady, is only one of three known sculptors of cheese anywhere. The American Dairy Association and its dairy families across Indiana helped underwrite this year's artistry. 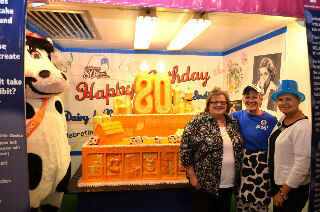 Kaufmann carved and tweaked the huge block of cheddar cheese into the image of a birthday cake, marking the 80th birthday of the Indiana Dairy & Nutrition Council. For the remainder of the fair, the finished sculpture is on display in a cooler in Our Land Pavilion. Chief sponsor on the building is Pioneer Hybrids International. It's located on the south side of the track, just west of the Indiana State Fair Administration Building, not far from the Diary Bar. If you are visiting the fair and want to see how the sculpture was produced, you can view it on You Tube. What's called a QR code is attached to a sign in front of the cooler displaying the large cheddar cheese sculpture. By using your smartphone to capture the QR image, you can find your way to the You Tube video. It takes the cheese sculpture all the way from delivery of the cheese to the grand unveiling once Kaufmann finished her work on the sculpture.